Showing your child the importance of saying “please” and “thank you” can help build their character. Good manners also instill confidence in your child because they will feel good about themselves for being polite. You and your nanny should also promote sharing, so that when your child is around other children, they are able to play without fighting over toys. Teach your child the importance of hard work and show them that if they focus they can succeed. However, this doesn’t mean showering your child with compliments for everything they do, whether it’s good or bad. You want them to understand that sometimes in life you have to experience failure to be able to move ahead. 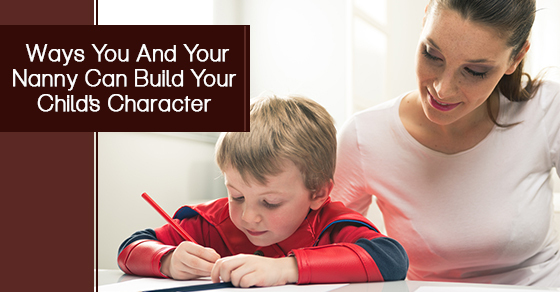 You should compliment your children when they deserve it but don’t go overboard. Children need to be able to trust the people around them if they’re going to trust themselves. A great way to stress the importance of trust is to let them do things on their own. For instance, let your child pick out their own clothes. This allows them to see that you trust them to do simple tasks like getting themselves dressed in the morning. The more you and your nanny trust your child, the more they’ll trust themselves. When your child says they’re feeling a certain way, it’s important to normalize those feelings. Don’t resort to stereotypical answers like, “Big girls don’t cry,” or “Boys are supposed to be tough,” when your child says they feel sad. Show them that it’s okay to feel the way they do. Use statements like, “Everyone feels this way from time to time,” and, “You’re not alone in feeling this way,” to let your child know that feeling sad, mad and happy are all a part of life. Children learn by example, which means you and your nanny need to be the type of people you want your kids to be. Kids are observant and will model themselves after you, so it’s important that you act the way you want them to. They’ll learn their social skills from watching the people around them. Thus, you and your nanny need to lead by example. The most important thing to remember when you and your nanny are building your child’s character is to remember that they’re just that: a child. Kids aren’t adults and you need to have patience and allow them to learn at their own pace.